What Wonderful Pets Delicious Treats! 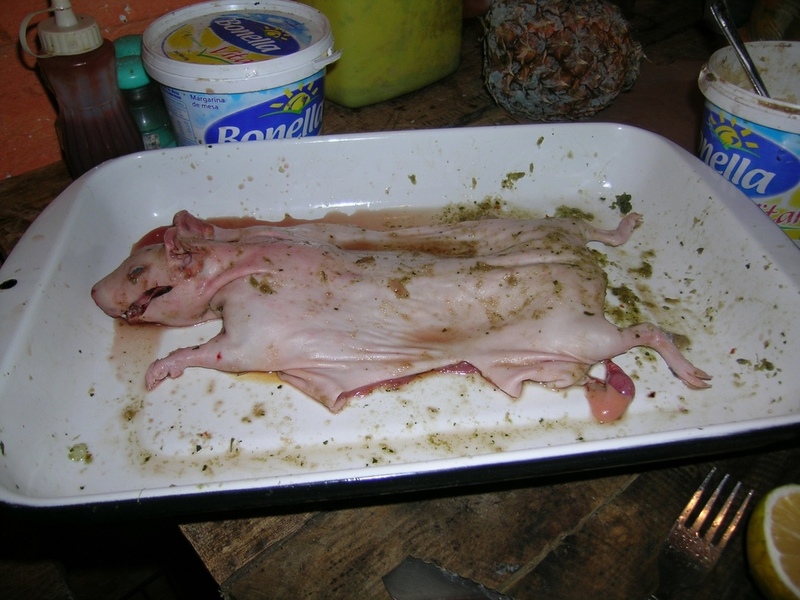 This is a page dedicated to cuy that enjoyable Andean treat. Cuy is guinea pig. It is also sometimes known as curiel, cobaya, or even conejillo de indias, indian rabbit. The word is Quechua not Spanish. It rhymes with gooey but is pronounced more rapidly. The name comes from the sound the animals make "cuy-cuy". In South America, specifically the mountain highlands, guinea pig is a traditional food and they are raised to be eaten. For poor highland dwellers it is often their only meat. In mountain towns is commonly found but can also be surprisingly expensive. 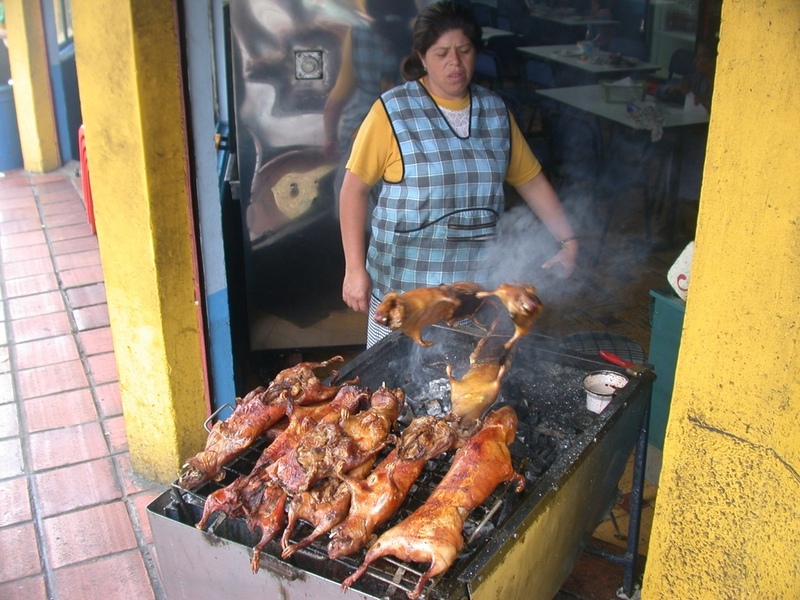 In Machachi, Ecuador for example locals can buy a roasted pig for $5 at a market stall. That is the same price as a whole roasted chicken but the chicken has many, many times the meat. And usually it costs more than a chicken especially for foreigners. In a touristy restaurant such as found on the Plaza de Armas in Cusco, Peru a $30 dinner is the price one can expect to pay. While I can understand tourist prices, I don't understand why the base price seems to be so high compared to chicken. Cuy is typically roasted over an open fire or if not roasted then baked. First it is skinned and gutted. If it is to be grilled or baked then the rib cage is often split so the carcass lays flat, belly down. If it is to be cooked on a spit the ribs are left intact and the body is jammed on a flat "cuy stick" (my term) or a thin rotating spit. The cooked meat is tasty but not particularily distinctive. Perhaps it is most like rabbit. Most people say it tastes like chicken and looks like road kill. Unfortunately there is not much meat on even the largest guinea pig and the skin can be a little tough after roasting. Personally I enjoy a good meal of cuy, but if I'm hungry I order something else. They are usually eaten a mano which means with the hands. I have seen pictures of what appears to be deep fried cuy. I'd love to try that. Don't miss my cuy photos and movie. I don't have any special cuy recipes of my own other than simply roasting. If you have a favorite recipe to share, by all means, email me and I will post it. Thanks. Picante de Cuy looks particularily savory.